For maintaining entries the Æ-DIR provider are used. Note: It is recommended to restrict network access to IP networks used by the roles above. web2ldap is a web-based LDAPv3 client to access and maintain LDAP servers. It is used as Æ-DIR's main admin user interface. Check out the documentation to find out about fine-tuning, customizing etc. aedirpwd_web is a small web application for password self-service (see user guide for instructions how to use it). All integrated hosts and services query the Æ-DIR consumers for accessing user and group entries and checking user passwords. Write access to consumers is deliberately disallowed. All write operations must be sent to the Æ-DIR provider systems. This chapter gives a high-level overview over the different roles and their access rights in Æ-DIR. See chapter access control for technical details. Æ admins (role assigned by membership in group ae-admins) directly manage all Æ-DIR systems and therefore have full write access (including manage privilege) to all LDAP entries. Furthermore this role has full read access to the audit database. Typically the Æ admins are not expected to know the systems using Æ-DIR or the users in detail. Therefore Æ admins are adviced not to perform daily maintenance tasks except those directly related to Æ-DIR systems. Æ auditors (role assigned by membership in group ae-auditors) have full read access to all LDAP entries including the audit database. Even when added to another user group members of group ae-auditors will not gain any write access. Zone admins have full write access (but no manage privilege) to all entries within a zone. Typically they perform the daily data maintenance tasks. The role is assigned to a user account by adding it to a user group with name *-zone-admins which is referenced by attribute aeZoneAdmins in the aeZone entry. Zone admins in the special zone people are People Admins and can write organizational entries (aePerson, aeDept and aeLocation) and maintain organizational management relationships. Zone auditors have full read access to all entries within a zone. Typically zone auditors need to read entries to reference them from another zone where they act as zone admin. The role is assigned to a user account by adding it to a user group with name *-zone-admins or *-zone-auditors which is referenced by attribute aeZoneAuditors in the aeZone entry. Setup admins can maintain (add/modify/delete) member hosts/services of a service group typically while setting up a hosts/services instances. They can read but not write the service group (aeSrvGroup) entry. The role is assigned by adding a user to a user group referenced in attribute aeSetupGroups in the service group (aeSrvGroup). Normal Æ users can read their own person and user entries including own group membership and all user entries which are in at least one common user group. Users can set their own password but cannot read it. The system role Æ replicas can read all entries including userPassword except some sensitive attributes only usable by role Æ provider. The role is assigned to service accounts (aeService) of all provider and replica slapd instances by adding them to user group ae-replicas. The role is assigned to service accounts (aeService) of all provider slapd instances by adding them to user group ae-providers. The system role Æ login proxy can read all attributes in user, group, service group and service group member entries needed for determining user role relationship. The role is typically assigned solely to central service accounts (aeService) in zone ae by adding them to user group ae-login-proxies. 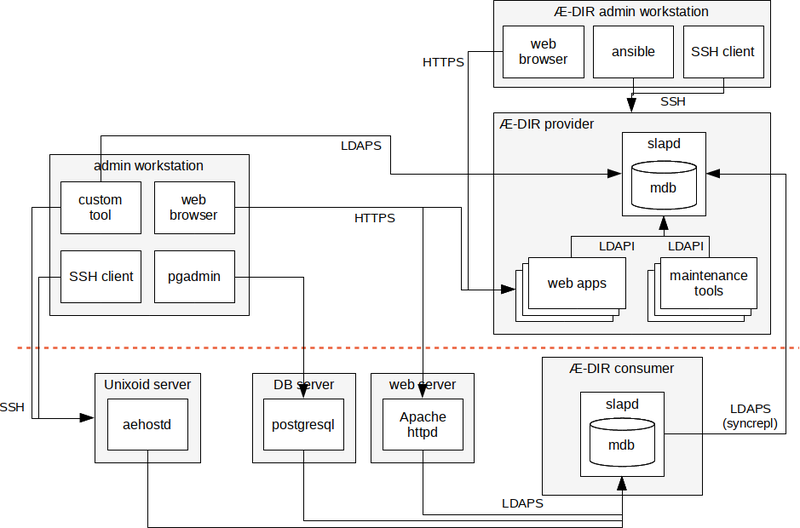 The following diagram illustrates the directory information tree (DIT) structure of Æ-DIR in naming context ou=ae-dir where all Æ-DIR entities are stored as separate LDAP entries. The nodes contain the relative distinguished name (RDN) and the structural object class used for that entry. The tree structure is also formally specified (within web2ldap's configuration) with DIT structure rules and name forms. Zone ae is used for administration of Æ-DIR itself. Therefore some special restrictions apply. Zone people is used for storing organizational entries. These can be maintained manually or could be synced with a HR system or similar if appropriate. Make sure to avoid hen-and-egg issues when syncing entries. Manual maintenance is done by role People Admin. The following diagram illustrates how the different entities in Æ-DIR are referenced from each other. This entity relationship is evaluated by the OpenLDAP ACLs to determine access rights of bound entity. A reference is set by adding an appropriate value to a link attribute. 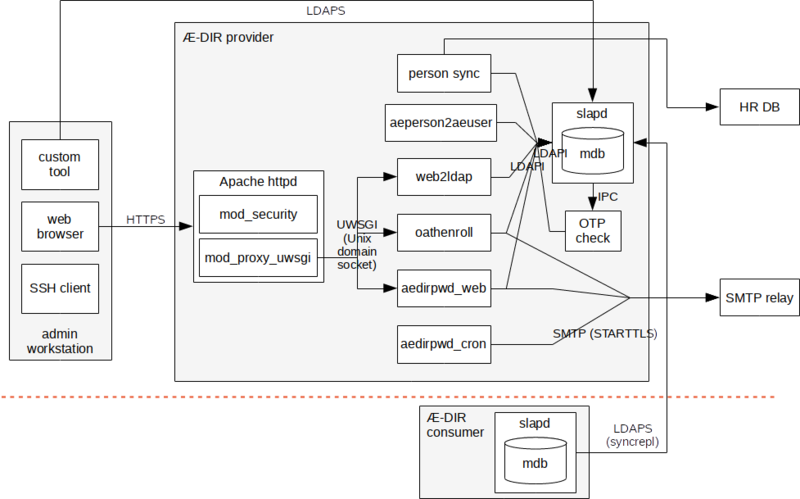 The following smaller diagram shows only references for assigning Æ-DIR roles. Users, user groups, service groups and services / hosts all in one zone. This gives the responsible zone admins full control over all authentication and authorization but also places the burden of having to maintain all these entries on them. This model should be used for hosts/services with high security requirements with access probably only for rather few administrators. A zone admin can add users located in foreign zones to user groups in their zone. The rights to assign permissions to users is preserved but user maintenance (e.g. helping with password reset) is delegated to foreign zone admins. This model is reasonable for most hosts/services. The cross-zone reference link from aeGroup to aeUser/ aeService. Delegating permission assignment (granted by group membership) can be achieved by referencing user groups in another zone from a server group. Note that different permissions are assigned by different link attributes and application-specific permissions for groups within services. The cross-zone reference link from aeSrvGroup to aeGroup. For each entity in Æ-DIR there is a distinct structural object class (see also RFC 4512 section 2.4.2). All Æ-DIR object classes are derived from multiple abstract and structural object classes defined in various other standards. Must / should contain short description of the purpose / reason / usage of an entry. Especially this attribute is very often displayed as pop-up title in web2ldap. requested Especially useful for adding an entry without making it directly usable, e.g. in case a confirmation is needed. active In this state an entry is visible depending on the normal ACLs. deactivated In this state an entry is still visible for zone admins/auditors but is not usable on systems/services. The entry can be set to active by zone admins if no other constraint disallows it. archived In this state an entry is invisible even for zone admins/auditors and some attributes might already been stripped off due to privacy regulations. Which attributes are stripped is to be defined as local policy. If set this triggers auto-expiration of entries and specifies the value to which aeStatus is set when aeNotAfter is in the past. This attribute is used to record the bug/issue tracker ID of the last change applied to an entry. The entry must not be actively used before this timestamp. The entry must not be actively used after this timestamp. This attribute contains names (attribute cn) of aeTag entries useful for marking various entries across zones or other boundaries. This eases searching for entries which are used together to provide a certain service. The object class aeRoot is solely used for locating an Æ-DIR tree within another tree of other entries. Especially it also serves as start point to Æ-DIR's specific DIT structure rules and name forms. set to "Æ-DIR - Authorized Entities Directory"
The object class aePolicy is used for policy / security parameter entries. The real effective policy parameters are supposed to be attributes of AUXILIARY object classes added to the entry. The object class aeDept is used for entries for departments or units within an organization. The object class aeLocation is used for entries representing geographic locations (offices, data centers) which are referenced from aePerson or aeHost entries to indicate the current location of these objects. The structural object class aeTag is used to create tagging entries mapping an arbitrary name (RFN attribute cn) to a meaningful usage definition in attribute description. Must contain short description of the purpose / meaning of a tag. Entries of object class aeZone are simply used as container for delegated administration. Besides the meta attributes and the zone name in attribute cn for forming the RDN there are no other attributes therein. Associated departments referenced by DN of aeDept entry. If set, this constraints the set of persons, for which aeUser entries can be added within this zone to matching department members. Associated locations referenced by DN of aeLocation entry. If set, this constraints the set of persons, for which aeUser entries can be added within this zone to same location(s). Distinguished names of all aeGroup entries which's members act with role zone admin for the zone. Constraint enforces that the group exists, is active and has name (attribute cn) of the form *-zone-admins. Distinguished names of all aeGroup entries which's members are allowed to change password of aeUser entries and thus circumventing the password reset process. Constraint enforces that the values are a subset of aeZoneAdmins. Constraint enforces that the group exists, is active and has name (attribute cn) of the form *-zone-admins or *-zone-auditors. Person entries are added using object class aePerson. Note that such an entry is not a user account and thus cannot authenticate to a the directory. Typically aePerson are maintained by human resource (HR) or sales departments (for customers), optionally synchronized from HR database or a customer relationship management (CRM) database or similar. Unique primary key possibly used for synchronisation. This attribute is readable to various roles. Another unique primary key possibly used for synchronisation but subject to stricter access control due to privacy regulations for HR databases. A limited subset of the widely used attributes defined in RFC 2798. Accounts for persons are created by using object class aeUser. For compability reasons with existing software aeUser is derived from the superior object classes account and inetOrgPerson. This object class must not be used when creating system/service/tool accounts. For these use aeService instead. Associated departments referenced by DN of aeDept entry. If set, this constraints the set of persons whose aeUser entries can be added to the group. Associated locations referenced by DN of aeLocation entry. If set, this constraints the set of persons whose aeUser entries can be added to the group. In general a service group contains service instances which are together providing a service and are thus considered subject to unified administrative rules. So for each service providing a user login a service group entry has to be added with object class aeSrvGroup. Likely a clustered service consists of multiple hosts or other services which are called the members of the service group. Distinguished names of all aeSrvGroup this service group depends on for providing its own service. sudoers rules are stored in entries of object class aeSudoRule. The attributes are compatible to those defined for sudo-ldap plus the meta information of aeObject and some constraints. The attribute sudoUser is constrained to only contain the name of a group (cn of an aeGroup entry) prefixed with a single percent character. You must set attribute sudoHost to ALL because restricting sudoers rules to hosts is better achieved by restricting visibility in the service group (attribute aeVisibleSudoers in aeSrvGroup entry). Object class aeService is used for creating accounts for services (sometimes called tool / machine / system account or similar). The service must authenticate by using bind-DN/password or TLS client cert. aeService entries may have a password (attribute userPassword) to authenticate to Æ-DIR. X.509 client certificate(s) may be associated by adding AUX object class pkiUser and setting the attribute seeAlso to the client certs subject-DN. Member of aeGroup to access other resources as client (similar to aeUser for humans). Member of aeSrvGroup to access user/group information when providing a service to users. Object class aeHost for host systems with login service for the operating system on this host. Hosts are at least member of the superior aeSrvGroup entry. Hosts can be member of other aeSrvGroup entries by adding those to the aeSrvGroup attribute. Hosts must not be a member of aeGroup entry. The host must authenticate by using bind-DN/password or TLS client cert. Entries may have a password (attribute userPassword) to authenticate to Æ-DIR. X.509 client certificate(s) may be associated by adding AUX object class pkiUser and setting the attribute seeAlso to the client certs subject-DN. SSH host keys may be associated by using AUX object class ldapPublicKey and setting the attribute sshPublicKey. Object class aeAuthcToken is used to add entries for personal authentication (OTP) token devices (e.g. yubikey). Object class aeNwDevice is used to add entries subordinate to aeHost entries for network devices available on that particular host system. Various auxiliary object classes are used to provide supplemental attributes. The DIT content rules defined for structural object classes restrict which auxiliary object classes can be added to an entry (see also table of structural object classes). The auxiliary object class posixAccount contains multiple attributes required for POSIX login to Unixoid operating systems (see RFC 2307). The auxiliary object class inetLocalMailRecipient contains multiple attributes used for SMTP e-mail routing (see draft-lachman-laser-ldap-mail-routing). The auxiliary object class pkiUser is used ... (see RFC 4523). The auxiliary object class ldapPublicKey is used to store SSH public keys in (see openssh-ldap-publickey). Different backends are used on all slapd instances listed in the following table. When using two-factor authentication bind requests are externally processed. The bind requests are passed to the external bind listeners by configuring slapd-sock(5) as overlay. Access rights are granted based on simple group membership. Access rights are granted based on DIT with distinguished names matching certain regex patterns. Access rights are granted based on (indirect) entity relationship by following the references from entries to other entries. If you set ansible variable apparmor_enabled: True then AppArmor profiles and abstractions are installed to confine all components to enforce mode. Only supported on Debian Stretch and openSUSE/SLE. Various systemd security configuration options are used when starting services via systemd units. See ansible variable aedir_systemd_hardening for global settings.